You have found the website for one of the premier professional swing bands in the UK, Silk Street Swing. We are a group of full time professional musicians who have been providing top quality music for hundreds of parties, weddings, cabarets and corporate events since we formed in 2009. If you are looking to hire a swing band or book classy entertainment for your party then look no further. With years of experience and a range of enticing different line ups to suit your requirements, we can bring an extra special something to your party, wedding or event. We can provide music for anything from toe-tapping swing dance parties, unforgettable gangster themed events, sultry background music or jiving wedding receptions with a difference. We know that each event we play for has unique requirements and therefore we offer a personalised, professional service to get you exactly what you want. So choose from the full on Rat Pack experience to sultry and intimate jazz soloists. We have male and female vocalists available to join us and sing all your favourite songs if required, and if you are thinking of hitting the dance floor, be sure to request our drummer as your guests will find it impossible to resist his groove! 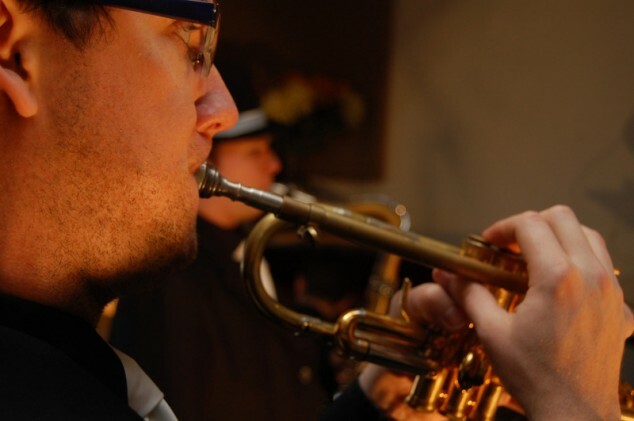 Choose the full five piece big band for that authentic swing sound or if you are looking for something more intimate, we can provide talented soloists, two piece and three piece ensembles. To fully complement the tone of your occasion we have a range of different stylish outfits from lounge suits to vintage attire that we can wear at your event so feel free to mention how you would like us to be dressed. In addition if you have any special sound system or acoustic requirements we should able to work with almost any set up. Just provide us with as many details as possible when first making your enquiry and we will do our best to meet your needs, whatever you require. Check out our songs page where you can browse a list of our favourite numbers. If you have some other special songs you’d like us to learn before your event, give us a bit of a notice and we will be able to play almost anything you’d like! It is not difficult to hire a swing band in England, but you want to hire the best! If you’d like to talk to us about what we can do for you or find out if we are available for your party or event, it’s easy to contact us for a chat. Just call us on 0800756 5512 or fill out our online enquiry form, and we will get back to you within 24 hours. We appreciate the important of cost when hiring a swing band and are happy to discuss how we can work within your budget to get the music you need for your event. Just contact us with your requirements and we will be happy to help. If you’re still looking to hire a swing band in England, do check out our testimonials page and see reviews of events we’ve done recently.